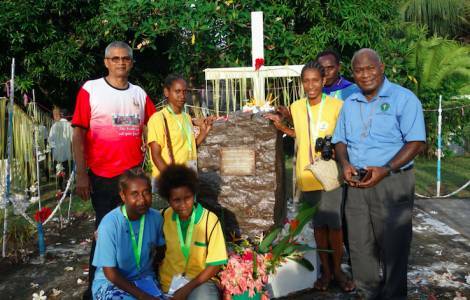 Rabaul (Agenzia Fides) – “Called to fullness of life and love”: is the theme of a National Youth Congress taking place in Vunapope, a province of New Britannia, in Papua New Guinea, with the participation of 260 young people from various dioceses of the country who have an opportunity fo live days of prayer, reflection and growth in the faith. Organised by the Catholic Bishops’ Conference in cooperation with the archdiocese of Rabaul, the meeting opened official on 8 December in the Sacred Heart Cathedral in Vunapope, near Rabaul. The congress will include meetings and catechesis on the theme of “celebrating life” through the Eucharist and the Sacrament of Reconciliation and also include preparation of young couples for the sacrament of Matrimony. Bishop Rolando Santos, CM, of the diocese of Alotau-Sideia, sharing the story of his own vocation encouraged them to “pray and never to be afraid to bear witness to Christ”. A highlight if of the congress was visit to patients at St. Mary's Hospital Vunapope where the young visitors were given a warm welcome.